The ship was on its way to Singapore where it docked after the collision. 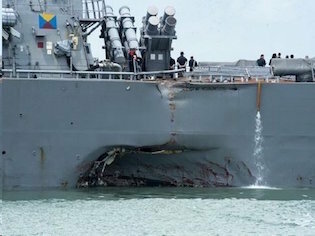 Photos show a deep gash in the ship's hull. The McCain took part in a freedom of navigation operation by sailing within 12 miles of the disputed Mischief Reef in the South China Sea earlier this month. A Chinese navy frigate shadowed the McCain during the passage and ordered it to leave what it claimed were Chinese waters. Beijing also issued a formal diplomatic protest note as a violation of its maritime sovereignty. On June 17, the destroyer USS Fitzgerald collided with the merchant ship MV ACX Crystal about 90 miles southwest of Tokyo. The incident killed seven sailors in their sleeping quarters below deck and severely damaged the warship's hull. The Crystal was likely operating on autopilot at the time of the collision, raising the possibility that hackers may have broken into the ship's control network and directed the ship to hit the Fitzgerald. The two destroyer collisions are unusual because warships are equipped with multiple radars capable of detecting ships as far as 20 miles out. Watch officers on the bridge also are in charge of checking for nearby vessels. In the case of a ship on a collision course, Navy radar operators will signal the bridge that a "constant bearing, decreasing range" contact is detected once radar detects a vessel on a collision course. Watch officers on the bridge normally would notify the captain and recommend that the ship change course to avoid the collision. Navy experts say collisions between slow moving freighters and fast Navy ships that occur are normally the result of two mistakes by the warship operators: Allowing the warship to get close to an approaching vessel in the first place, and then having to maneuver at close quarters to avoid it. "This is obviously an extremely serious incident," Richardson said. "And is the second such incident in a very short period of time. And very similar as well." Richardson said he has ordered Navy ships to conduct an operational standdown for one or two days so that procedures of all surface fleets can be reviewed. The operational pause means most Navy operational activities will halt during that period. "The emphasis of that is really to look at the fundamentals at the unit and team levels to make sure that we're not overlooking anything in what I would call the blocking and tackling of the basic seamanship, airmanship, those sorts of things, team work, how we do business on the bridge," Richardson said. The results of that review over the next week will be used to produce a "lessons learned" from recent incidents. The problems also appear to be part of the Pacific Fleet, Richardson said. Both the McCain and the Fitzgerald are part of Destroyer Squadron 15 and the Seventh Fleet. 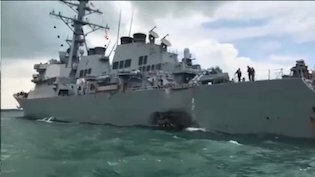 In addition to the McCain and Fitzgerald collisions, in May the USS Lake Champlain, a guided missile cruiser, collided with a South Korean fishing boat in waters near South Korea. No injuries resulted from that incident. In January, the guided missile cruiser USS Antietam ran aground in Tokyo Bay, damaging the ship's propellers and spilling oil into the water. That incident also resulted in no injuries to the ship's crew. 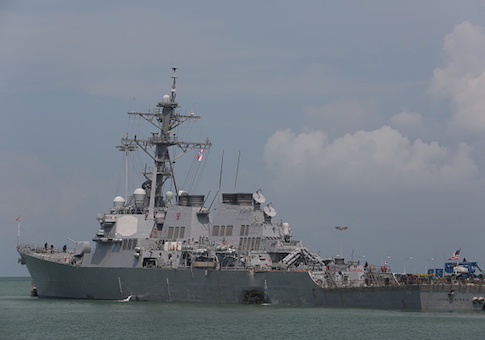 The need to repair the damaged hulls of both the McCain and Fitzgerald mean the ships will be unable to take part in the Navy's Aegis missile defense systems at a time when threats posed by North Korean missile attacks in the region are increasing. Pyongyang recently threatened to fire test missiles near Guam but appeared to back down from firing missiles toward the U.S. island under pressure from the Pentagon. A Navy official said the loss of two missile defense warships will not have an immediate impact on Navy regional missile defenses for forward deployed forces in the Pacific. However, "the long term effects remain to be seen," the official said. In addition to the two-day halt in Navy surface warship activities, Richardson said the Navy also is conducting a longer-term review to see whether the problem is related to Navy forces in Japan. That review will be headed by Adm. Philip S. Davidson, commander of U.S. Fleet Forces Command. "This will be a broader effort looking at a number of things," Richardson said, noting the situation of Navy forces in Japan. The longer-term review will examine training and readiness, trends in operational tempo, maintenance and equipment, and personnel. A Navy official said budget cuts and fiscal uncertainty as a result of the Budget Control Act of 2011 limiting defense funds may be to blame. "As a result of decades of not having a competitor to drive fleet focus, high tempo and fiscal uncertainty and under funding, we are seeing fraying in surface and aviation," the official said. "By this review, the CNO wants to see how bad it is and then quickly address it." That review also will delve into the process the Navy used to develop surface warship drivers. In addition to Navy experts, the review will include experts from other military services as well as outside experts. China, meanwhile, has been covertly attempting to take control of the strategic waterway in a political battle over freedom of navigation. Beijing reacted to the latest collision by calling the Navy a hazard to shipping in the South China Sea. The Global Times newspaper, an official publication of the Communist Party of China that often reflects official military views, reported that the Navy in Asia poses a "growing risk to commercial shipping." "While the U.S. Navy is becoming a dangerous obstacle in Asian waters, China has been making joint efforts with the members of the Association of Southeast Asian Nations to draw up a Code of Conduct for the South China Sea and it has boosted navigational safety by constructing five lighthouses on its islands," the newspaper said. "Anyone should be able to tell who is to blame for militarizing the waters and posing a threat to navigation." Chinese propaganda outlets did not report widely how a People's Liberation Army Navy frigate ran aground in the South China Sea in July 2012 and was stranded for 10 days near the disputed Spratlys islands near the Philippines. Press reports in the region at the time called the incident "the bully that ran aground." The Navy official called the Global Times report "an opportunistic and uninformed view on how these recent mishaps play into the broader context of the region." "It's sad to see the Chinese use this loss of life as a way to advance their area interests," the official said. On the possibility that China may have triggered the collision, Chinese military writings indicate there are plans to use cyber attacks to "weaken, sabotage, or destroy enemy computer network systems or to degrade their operating effectiveness." The Chinese military intends to use electronic, cyber, and military influence operations for attacks against military computer systems and networks, and for jamming American precision-guided munitions and the GPS satellites that guide them, according to one Chinese military report. The Navy traditionally adopts a strict policy of accountability for all ship mishaps. On Friday, the two senior officers on the Fitzgerald were relieved of duty, and about a dozen other sailors who were on watch the night of the collision were punished. A preliminary report on the Fitzgerald collision provided no details on the cause of the incident.